I have been kicking this idea around for awhile now. 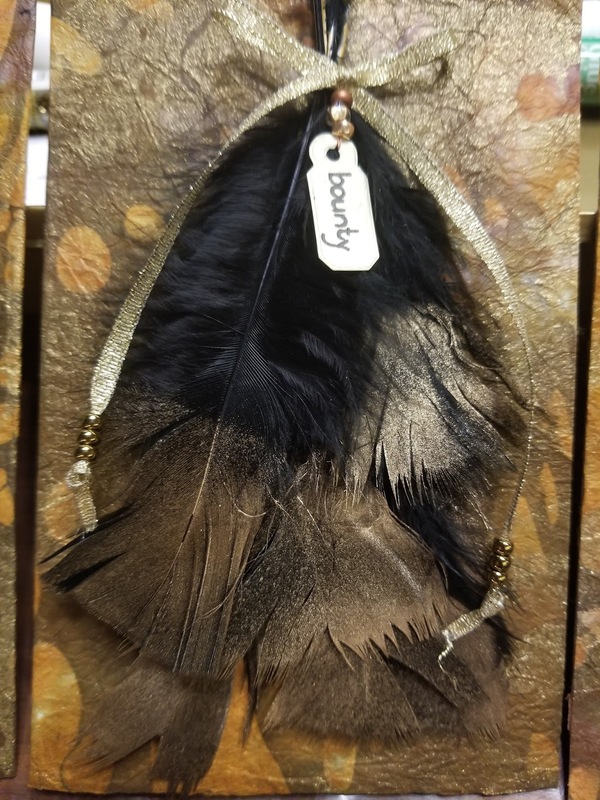 I like the idea that feathers represent "bounty" and "abundance." I wanted to find a way to meld these ideas into my first Mindfulness card of the New Year. I kept seeing pictures of gold-dipped feathers all over Pinterest. I knew I just had to try this! Then I had to figure out how to gather a bunch of feathers in a way that I could mount them onto a 2-D card. I had purchased some beautiful Italian papers with colorful feathers on them. Of course, I couldn't find them when I needed them--or couldn't remember that I had already used them--either way, I wouldn't be able to use that paper for my background. Then I remembered that my sister-in-law had gifted me with the most gorgeous marbled papers that she found while traveling in Thailand! I found my stash and after going through all of the papers, I settled on the background you see here. The colors are deep and earthy with a touch of gold. I trimmed the paper down to cover the front and back sides of my chipboard card. This palette screamed for gold-dipped black feathers. I could have painted the tips with gold acrylic paint, but ended up spray painting them when I saw that I had a can of metallic gold spray paint on hand. Quick and easy! A little painter's tape to mask the bottom half of the feathers and voila! Gold-dipped black feathers! I gathered a small bunch of feathers and wrapped them with very thin wire. I tied a gold ribbon embellished with gold beads around the wire and threaded my "bounty" tag onto it. 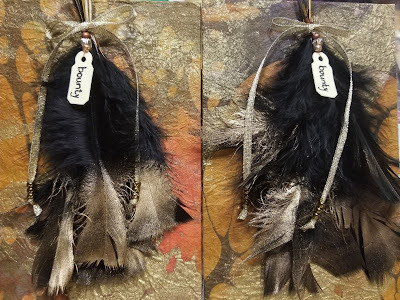 I glued the background paper to the front of the card and then stapled the bottom layer of feathers to the card to secure the bundle to the card. Fortunately, I remembered NOT to glue the background paper to the back of the card until after I had finished stapling.